You hear these terms thrown around by Geeks as if everyone within earshot knows, but what is FTP? FTP simply stands for File Transfer Protocol, which is a standard, like the HTTP you use to load web pages, that uses the client server model to transfer files between computers. FTP functionality is built into almost every operating system I’m aware of, but usually with the most basic functionality, or using hard to remember commands that have to be typed manually. 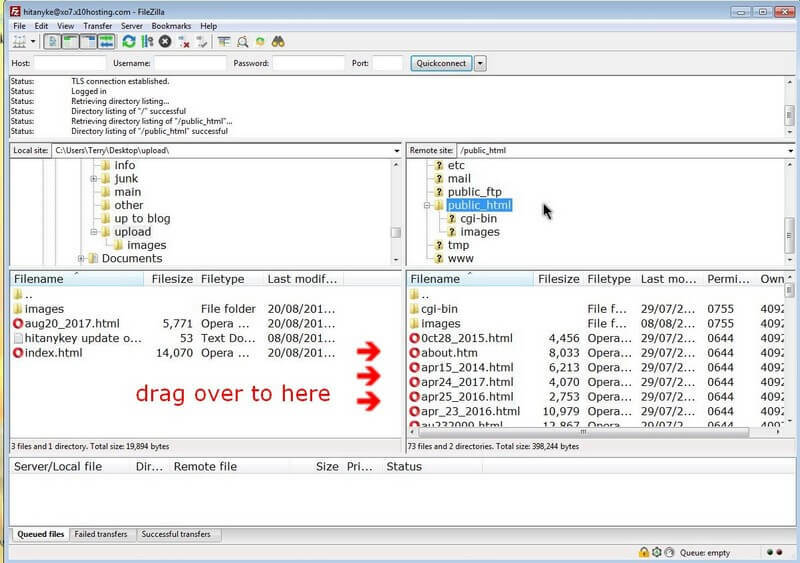 The FileZilla FTP program is very simple to use. First you need to get the FTP account information from a hosting service, or from the computer you wish to transfer files to or from, which includes Host, Username, Password, and Port. Fill in the information in the spaces provided at the top of the program. 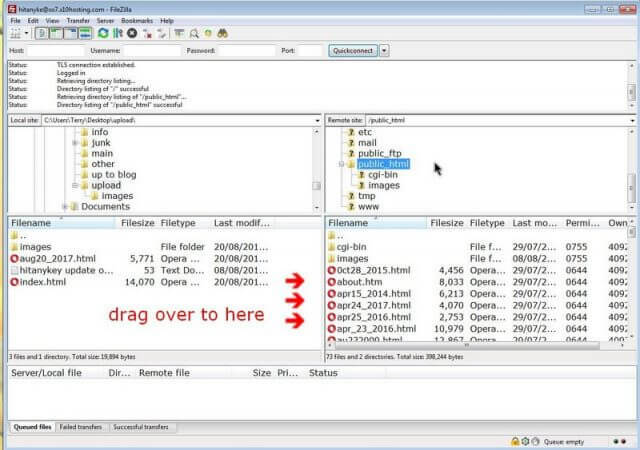 FileZilla automatically saves the connection information so the next time you use it just click on the downward arrow by the Quickconnect button and choose your login. Click on Clear history if you don’t want the login saved. Then you’re facing two Windows, like File Managers. The one on the left is for files on your computer and the one on the right is your server’s system. On the Local site section navigate to the files on your computer you want to upload. 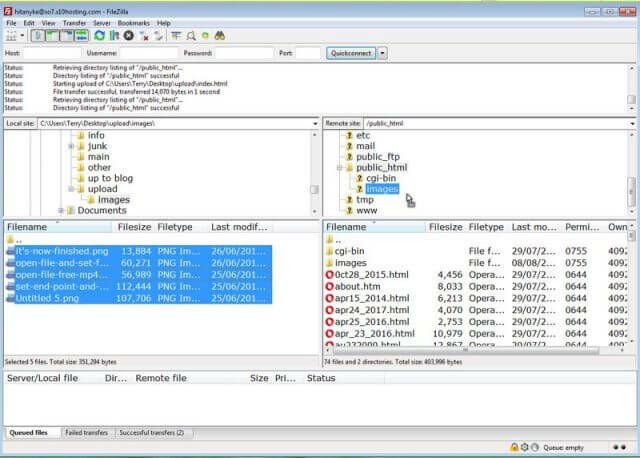 On the Remote site side choose the folder you want to upload to. In my case I have to place my files in the public_html folder. 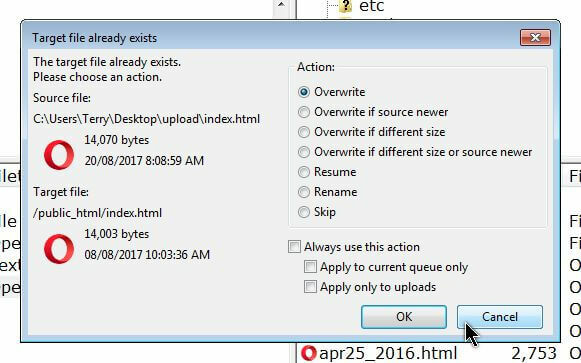 So in my example I have two HTML files to upload aug_2017.html and index.html. The text file is not for upload. So basically, I just have to drag them over to the Remote site folder. It’s as simple as that. Then I do the same with the pictures. I click on the images folder on the Local site and drag them to the image folder on the Remote site. The image folder is there where I originally dragged the image folder over that contained all 281 pictures of my site. Chose whatever options you prefer and then click on OK. There is a disconnect button at the top of the program which looks like a computer tower with a small red x by it. I just close the program, which closes the connection automatically. So my new site is Hit Any Key. Used FileZilla FTP for years when I was the support person for our club’s website. This along with the free KompoZer web authoring program made a great team. Now the club uses Google Sites and the editing is online. One good use for FileZilla FTP would be to use it with Google Drive for uploading club documents. So far I have not found a way to do this.